Former police officer Ruben McAusland, who was sentenced to more than five years in prison on Wednesday afternoon, is seen assaulting a suicidal man in two videos. 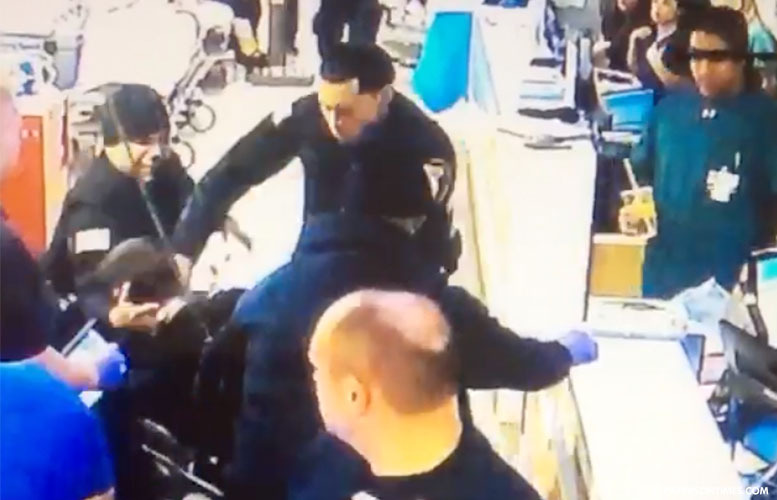 McAusland punches the victim, Andrew Casciano, in the waiting area of St. Joseph’s Regional Medical Center in front of a number of people, in one video. In another video, McAusland is seen twice striking the victim across the face. Both videos, posted below, were shown at McAusland’s sentencing. The incident happened on March 5, 2018. A suicidal man called 911 and was taken by an ambulance to St. Joseph’s Medical Center. Two officers, McAusland and Roger Then, responded to the victim’s home and followed the fire department ambulance to the hospital to monitor him. A pair of videos captured at the hospital that night showed the victim in a wheelchair. In the first video, the victim throws an object down the hallway. Angry at the victim’s conduct, McAusland pushes the wheelchair with his hands and punches the victim in the face. McAusland puts on a pair of gloves and violently strikes the victim twice across the face, according to charging documents. Both officers submitted false police reports that did not include their attacks on the victim. Then is expected to be sentenced next week. The judge ordered McAusland to pay $32,892 in restitution to Casciano for the latter’s medical expenses. THIS GUY, LIKE THOUSAND OTHER LAW ENFORCEMENT OFFICERS ARE COMPLETELY DAMAGE WITH A LOT OF MENTAL ISSUES AND PERSONALITY DISORDERS….FOR THIS SAME REASON IS THAT EVERY LAW ENFORCEMENT AGENCY AND DEPARTMENT FROM EVERY CITY, COUNTY, STATE AND FEDERAL SHOULD ENFORCE A PSYCHOLOGICAL EVALUATION, AT LEAST EVERY SIX (6) MONTHS TO EVERY SINGLE AGENT AND OFFICER JUST TO MAKE SURE THEY STILL FIT FOR THEIR DUTIES WITH DEALING WITH PEOPLE….WITH THE MONEY THEY ARE SAVING BY NOT DOING THIS THOSE DEPARTMENTS END UP PAYING A LOT MORE WHEN THOSE LAWSUITS COME THRU…. You are committing a crime with all this shouting. I'm going to have to call police to complain about loud noise. Hospitals, shelters, even bus and train stations now are all places that anyone can wind up, so police often treat the downtrodden there like garbage. "The system" usually inflicts the damage but this time it was officers who weren't trained to show restraint in a situation where it was obviously warranted. I hope that good cops get sick of negative PR like this and help to clean house by not remaining silent. Why is it this only happens in Democrat Liberal ran cities? Perhaps hiring practice? Ever see Police in Paterson? Of course not all but alot of them are a shame in Paterson. Wrong. It happens anywhere there are cops. It's what they do. What an idiotic thing to say ! Move along troll ! environment which is good but not when the same public servant does criminal acts like these. and let this police criminality continue.